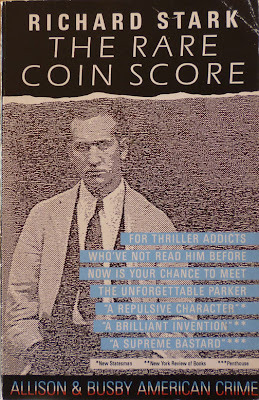 This British paperback edition of Donald "Richard Stark" Westlake's ninth Parker novel, The Rare Coin Score, was published by Allison & Busby in 1988. I bought it in the Lewes branch of charity shop Oxfam the other day (witness the Oxfam price sticker still affixed to the back), which makes it the one and only Richard Stark novel I've ever seen for sale anywhere in Lewes (I've spotted at least one other non-pseudonymous Westlake paperback for sale – a Penguin edition of either Killy or 361, I think it was). At least, up to now, anyway: I donated a couple of unwanted Stark books to charity at the weekend, so there might be one or two ex-library editions still floating about. Those apart, though, it's safe to say Richard Stark doesn't generally feature in Lewes's various bookshops and charity shops, so of course I snapped up this edition of The Rare Coin Score when I saw it, even though I already own an Allison & Busby hardback of the same novel. But before you berate me for depriving some other Lewesian of the pleasure of the novel (and bearing in mind that I did, as I say, donate some Starks myself), let me just point out that this paperback is one I haven't seen before. Trent at Violent World of Parker doesn't appear to have it in his "known printings" cover gallery for the novel (feel free to grab the images from this post, Trent), and I don't recall ever seeing the cover online before. So by purchasing it and then blogging about it, I am, in a way, performing a service for the wider Parker community. In other words, Lewes's loss is the Parker obsessives' gain. As with almost all of the Allison & Busby editions of the Parker novels, the cover on this one was designed by Mick Keates. 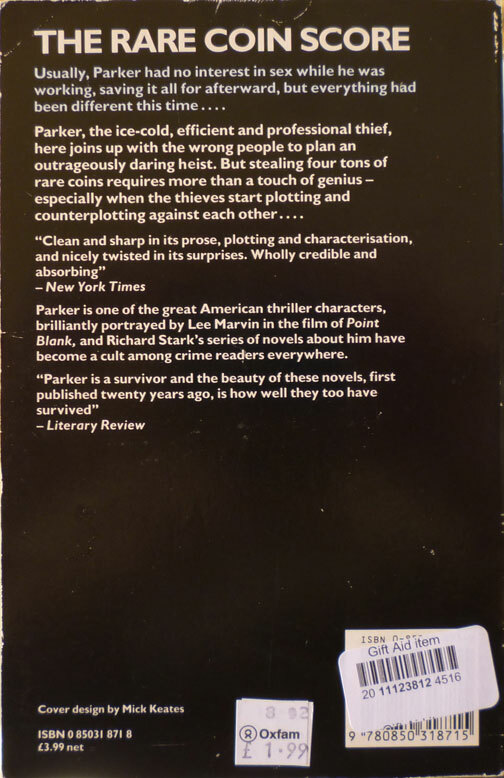 There were, as we've already established, three distinct phases of cover design during Allison & Busby's tenure as the British publisher of the Parkers (not counting the final one for Point Blank alone): from 1984-1986 there was the bold typographical approach of the initial eight Parker novels published by A&B; from '86-'88 there was the "torn" masthead and photo/film still style seen on paperbacks-of-hardbacks like Point Blank and straight-into-hardbacks like The Green Eagle Score; and from 1990-1991 there was that same torn masthead but incorporating illustrations by Stephen Hall. This paperback of The Rare Coin Score of course falls into the second phase; the fuzzed photo on the front looks familiar, but there's no credit, so I can't quite place it I'm afraid. Is that correct that you only paid 2 pounds for it? That is a score, indeed! I was debating to go to the next Parker so soon, which, coincidentally, is The Rare Coin Score. Your find is clearly a signal from the book gods that I must jump right in. Yep, two quid. And not only that, but the money goes to charity, too. Everyone's a winner. I was looking for your review of Rare Coin to link to in this post; now I know why I couldn't find it! So yeah, get readin', and I'll stick in a link when you've got a review up.